The village straggles along the lonely lanes between Redgrave and Bardwell. It is an intensely rural place, with none of the commuter feel of villages closer to Ipswich and Bury. Fields intersperse houses, hedges strike up gentle slopes. 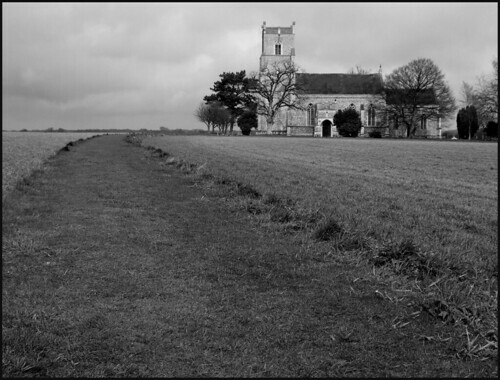 When I first came this way on a day in late August 1999, a freshly stubbled hay field spread beneath St Mary, lending it a grandeur as fierce as any church in the county possessed. I could not get inside that day, and did not come back for nearly nine years. Now, in the early spring of 2008, St Mary was a great ship in a still sea of green, a long causeway curving gently around to meet it in the west. When Cautley's editors came here, they found the tower damaged by a lightning strike, but one would never know this today. It has been repaired in the conventionally restrained 20th century manner, as at Orford. Otherwise, the church bears all the hallmarks of its 19th century restoration. The chancel was rebuilt quite early, in the 1840s, suggesting the influence of the Tractarians, and the entrance to the 15th century porch was recut. The niche above is probably original, though. Today, St Mary lists its keyholders, and visitors are welcome. You step into a great barn of a place, full of light. Medieval survivals are few, but fascinating. A strip of wood on the south nave wall is pierced by tracery holes, and was probably part of the rood loft. Mortlock tells the tale of how it was found when the village post office was hit by a bomb during World War Two. Intriguingly, the churchwarden at the time of the 1840s restoration was the village postmaster, and it seems safe to assume that he took this medieval panel home, perhaps to use in a repair. Opposite, high in the tracery of a north window, are two roundels that appear to be 15th century. One depicts the eagle of St John, while the other show a fat little kneeling monk with the inscription Thomas Albi. The memorial carver John Bacon produced a very early work in the chancel here, and it is signed J Bacon Jnr. Ft. ('J Bacon Junior made this'). As it was made in the 1790s, we must assume it was reset here when the chancel was rebuilt. Part of that rebuilding is one of the oddest piscinas I've ever seen, with fluted columns rising to a panel depicting Christ with the woman at the well. It would not look out of place in an Italian Catholic church, and I did wonder if some London or Birmingham workshop had produced it for a commission, only for a civil war to intervene, and the Market Weston churchwarden to snap it up from the sale shelf. Perhaps it was the same one who stole the rood loft panel. All in all, the interior of St Mary is a testament to that great age of Faith, the 19th century. Elements of the past have been preserved, and there is a sense of the renewal which the Victorians engineered, but retaining a character which is at once rural and devotional; I like it a lot for that.